Rep. Bourne filed legislation, House Resolution 916, honoring Kenneth Hobson for saving his family from a fire. She also filed House Resolution 915 honoring the Raymond-Harvel Fire Department. Bourne presented Kenneth and the local fire department with a copy of the resolutions at the event. Representative Bourne attended the Raymond-Harvel Fire Department’s annual dinner recently at the Knights of Columbus in Raymond. 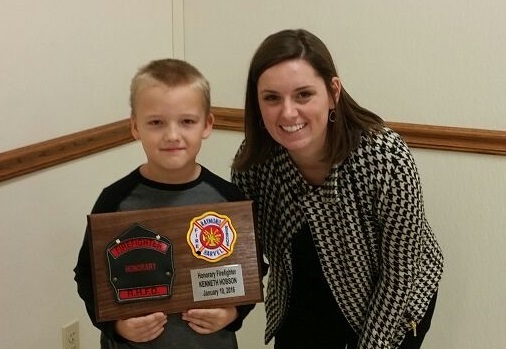 For this year’s gathering, the Fire Department invited 7-year-old Kenneth Hobson to recognize him for his bravery during a recent fire at his family’s home.